Landmark Properties recently agreed to invest in Tremont Crossing’s first phase: retail, an apartment tower, as well as a garage, museum, and central plaza (above). This site could be part of an expressway, or maybe a shopping mall. It might make a nice home for Partners HealthCare, or the state’s transportation bureaucracy. The Krafts’ soccer stadium? Sure, let’s give it a look. The proposed 1.7 million-square-foot complex is nothing if not ambitious, especially for this part of town: two towers with 700-plus apartments, 108,000 square feet of offices, a museum for African-American culture, a nearly 1,400-space garage. Then there’s 405,000 square feet of retail, fitness, and entertainment tenants — Brooklyn Boulders, Regal Cinemas, CVS, Starbucks, and a long-promised BJ’s Wholesale Club among them. Site work for this $700 million project could begin this summer, if not sooner. Buildings would start to go up next year. We’ve heard stories like that one before. This time, city officials say, it’s for real. Elma Lewis Partners has long eyed the site for a new National Center of Afro-American Artists museum. 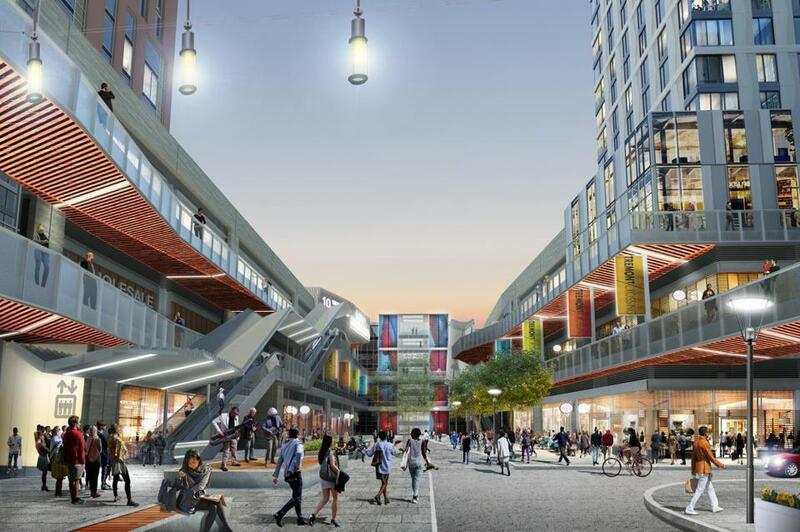 The current Tremont Crossing team began taking shape in 2010 when Elma Lewis joined with the Feldman family’s Feldco Development Corp., which was drawn in part by the proximity to the Ruggles T stop. All the while, civic leaders grew tired of the tumbleweeds. Former mayor Tom Menino in 2013 famously tried to persuade Partners execs to move there; they relocated their offices to Somerville instead. Deval Patrick attempted to move MassDOT there, but Charlie Baker nixed that idea after becoming governor in 2015. At first glance, the flat property appears easy to develop. But looks can be deceiving. BPDA director Brian Golden points to various discussions with city agencies that had to happen before the deal could be sealed: a plan to move a major sewer pipe; a peace agreement with Boston Public Schools (The Madison Park and O’Bryant high schools are next door. ); technical work to lay out a new street grid. Another crucial factor: Georgia-based Landmark Properties recently agreed to invest as an equity partner in the development’s first phase: all the retail, one of the apartment towers, as well as the garage, museum, and central plaza. So what’s next? BPDA officials say the ground lease is still being negotiated, but the city will charge below-market rent, and nearby residents will get preference for half of the 100 income-restricted rental units. The recent success of nearby redeveloped parcels — the Tropical Foods and the Residence Inn on Melnea Cass Boulevard, for example — has helped stoke private-sector interest in a part of the city long overlooked by developers. This place was always something we passed by on the way to somewhere else, a fenced-in testament to the vagaries of city planning. Perseverance is finally paying off, after the site remained largely untouched as building booms came and went. City blocks don’t get built overnight. But they usually don’t take this long, either.